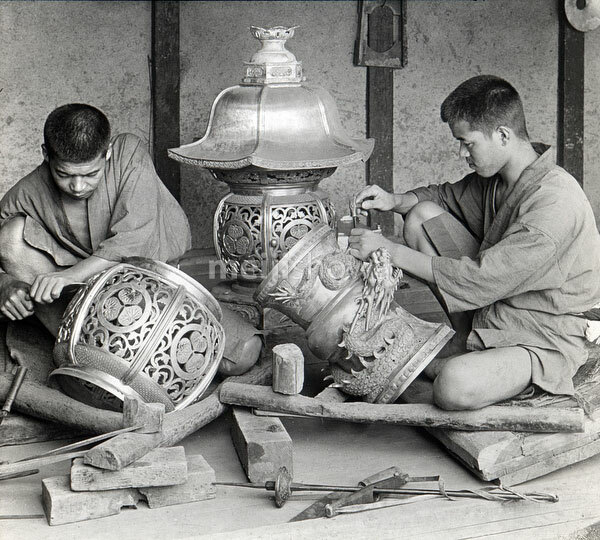 Two men in traditional clothing are carving bronze lanterns for a temple at the workshop of N. Nogawa, a manufacturer of bronze ware on 22 Shijo Otabicho, Kyoto. The lanterns are for a temple on Mount Koya (高野山, Koya-san) in Wakayama Prefecture. The tool on the floor is a pump drill. Although the original caption claims that this image was photographed in Kyoto in 1924 (Taisho 13), it was really shot in 1906 (Meiji 39). This is actually one of Herbert Ponting’s final images before leaving Japan for the last time.